A specially designed 40 foot cruiser suitable for up to 22 persons for day trips. 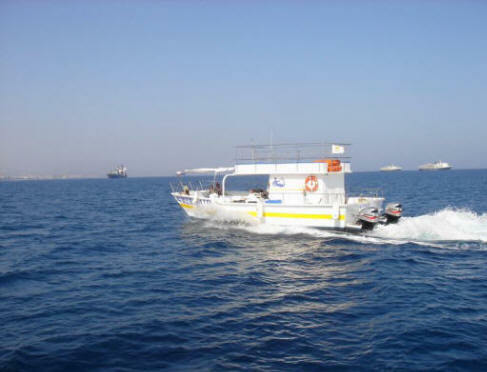 Ideal for octopus fishing, fully equipped with modern octopus fishing rods, VHS, GPS and Fish Finder. She has a double sun deck with plenty of seating space, spacious decks for fishing, diving and sunbathing, marine bathroom, shower facilities, CD music and shaded bar. The experienced and friendly crew is always on hand to make the cruise a wonderful experience. Whilst the fishermen try to catch their trophy fish, their partners can sunbathe on the top deck in privacy.